As a parent, you want your child to enjoy a great experience playing sports. You understandably look out for your child’s best interests and want to ensure that your son or daughter can succeed. In organized youth sports, however, your child's path to success is not an independent one. It's not just you and your son or daughter. Success is also tied to your child's coaches. Ideally, these coaches are excellent teachers, able to develop each young athlete's abilities. They help instill an enjoyment for playing the game. And together, all parties work together in a positive partnership. But sometimes, everyone is not on the same page, and misunderstandings lead to disfunction. Although you and your child's coach want the best for your child, each of you may have different views on how best to go about reaching this goal. The differences may lie in philosophy. A coach may believe success is largely dependent on hard work and sacrifice while you believe that a smarter, more balanced approach to development is the key. Other differences of opinion may arise out of the choices a coach makes. You may be baffled why your child doesn't start, or why the coach substitutes for your child at a key moment in the game. You may feel the coach is using your child "wrong." For instance, in competitive team sports, you may believe your child is best-suited to play a specific team role (e.g., point guard, pitcher, quarterback). And accordingly, you want the coach to play your child at a specific position. And finally, in youth programs that emphasize equal participation, you may think that your child should always get equal playing time each game. Equal is equal, right? Of course, there are times when your view is the correct one. Many youth coaches are volunteers who do not have a large amount of experience playing or coaching. They may also place too great of an emphasis on winning. But consider that a coach may have a different take on your child's talent, and how best to develop it. Also understand that a coach's responsibilities extend past those of you and your child. The choices he or she makes are made from a different perspective. 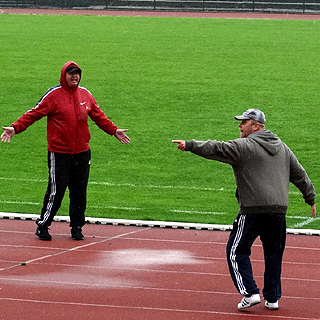 At some point, a conversation between the parent and coach can help bridge differences. Meeting with a coach in a non-emotional setting (i.e., not immediately after a game) is a good approach. Discuss your child's role on the team. Try to understand your coach's position and express yours. To help prepare you for any conversations about your child, you should first give some thought as to why the coach may act the way he or she does. Here are a few related points to keep in mind as you evaluate your child's coach, his or her methods, and the opportunities provided to your child. As you watch your child’s season unfold, and observe the coach’s actions as they relate to your child, understand that the coach’s goals and approach may vary from yours. First and foremost, he or she must balance the best interests of your child against those of the other children on the team, and the best interests of the team itself. Secondly, a good coach may accurately recognize existing traits in your child, along with potential abilities, that suggest a role for the child that differs from the one you envision. He may see a different path to success for your child. And finally, your child’s coach will have his own method of achieving results. If he follows the guidelines advocated in this blog, he will believe in building a custom framework of opportunities for your child over the course of the season—one that leads to growth and success. Several years ago, the mother of a seventh grade boy in a middle school YMCA basketball league approached me after a game. In no uncertain terms, she stated that her son should play the point guard position and that he was better than the current backup point guard. Although this boy had reasonably good ball handling skills for a player his age, and showed the markings of a potential point guard, he was undersized and physically overwhelmed by the older eighth and ninth grade boys. In addition, two other boys on the team demonstrated equal or better point guard skills and were better equipped physically to handle the speed and power of the game. For both the boy’s personal development and the best interests of the team, I decided to keep him at the off-guard position. As the season progressed, I gave the boy opportunities to play the point in practice and occasionally in a game; but his primary role remained the same. He developed an understanding of his role and how he could contribute now to the team in a meaningful way. We won the championship that year and both the boy and his mother were pleased with the way the season turned out. Gaining expertise in an important team role (point guard), and developing the necessary skills to play the role well, is a process that develops over time and with a number of influences. Regarding skill development for 4th grade and above basketball players, I follow a Teach Everyone Everything approach. From a point guard perspective, each child learns the key dribbling techniques in practices. Drills are run to teach keeping the dribble alive, the child's head up, seeing the court, and how and when to make the proper pass. But in most participation-based programs, kids of different ages, sizes, skill levels, and innate athletic ability, are grouped together on any one team. Expectations of what makes up a "fun" and successful experience vary. With limited practice time and the importance of certain roles to a team's opportunity to succeed, it's simply unrealistic for a coach in the typical youth program to provide every child with equal time at the key positions. In a league that promotes equal participation, some parents expect absolutely equal time in each game. Depending on the team match-ups, this may not be the best developmental approach. A coach may sometimes choose to play one player slightly more than another and instead balance playing time over the course of a season. By doing so, he can maximize the number of opportunities for both individual and team success. He or she can avoid placing players in situations in which they are over-matched and will necessarily fail. Against weaker opponents this coach will play the less-skilled players more than the skilled players, giving them increased responsibility and more challenging roles. In the example above, this is where the seventh grader gets to play point guard. If you are confused by the coach’s actions as they relate to your child’s development, talk with the coach to gain a better understanding of his approach. You may have a strong case for the coach reconsidering his or her approach with your child. But also recognize that the coach's responsibilities, along with his or her knowledge of the sport and experience developing young players, may lead in a direction different from yours. A great coach is going to do the absolute best they can to get everyone on the court/field, give players the chances to put their practice time to the test, learn new skills, gain more confidence and much, much more. But their absolute best may not always be enough for sports parents. Parents, of course, are looking out for the well-being of their child but a coach has to worry about a dozen other players too! Friction is bound to happen but that doesn't mean it should get ugly.